Quinqueloculina poeyana, copyright Dieter Ketelsen. 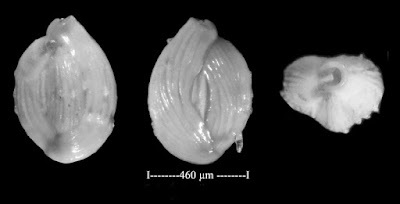 Quinqueloculina is a cosmopolitan genus of miliolid Foraminifera known from the Jurassic to the present (Loeblich & Tappan 1964). Characters (from Loeblich & Tappan 1964): Test coiled, with chambers one-half coil in length and alternating regularly in five planes of coiling 72° apart, but with successive chambers in planes 144° apart, so that three chambers are visible from exterior on one side of test and four visible from opposite side; wall calcareous, porcelaneous, imperforate, with inner pseudochitinous layer, rarely with some agglutinated grains added to exterior; aperture terminal, rounded, with simple or bifid tooth..